Fred Huggett on his Honda 500-4 very quick was Fred on this as can be seen from the Shellsport race winner stars, Brands Hatch 1976. Photo Copyrighted to Graham Etheridge. Pictures are now appearing for me without having to refresh the post page! 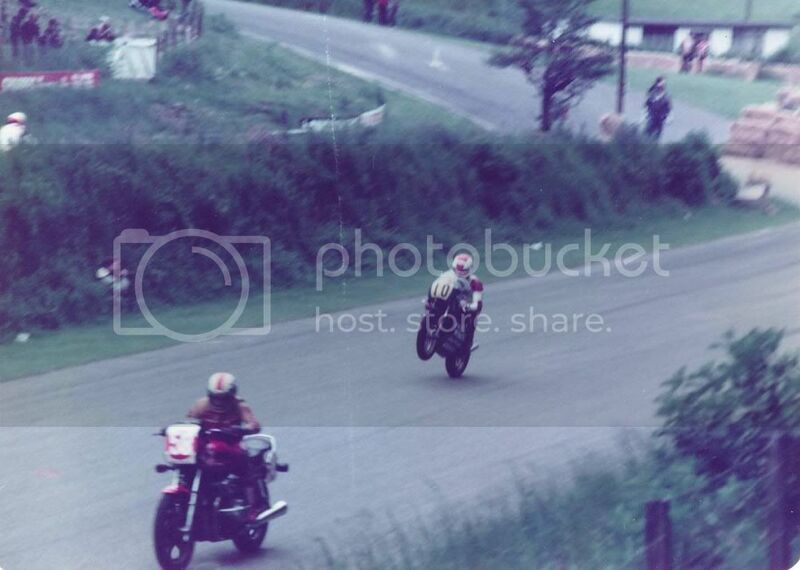 Jerry Fiford away first in this single cylinder race Snetterton 1975.
and now I have to refresh the post page again!! Edit - Nope nothing showing grrr!! Edited by Paul Collins, 30 November 2013 - 00:14. Russ Dowsing Brands Hatch 1977. Glyn was the workshiop manager at Andy Lee (international motocrosser and father of World speedway champion Michael) in Cambridge. Glyn to was a motocrosser and started off roadracing on a 500 BSA Victor powered machine. Andy bought a TR500 watercooled Suzuki in 1976 (he was a Suzuki agent) and Glyn was joined by Andys employee Chris Rossiter, for the second season when they had two. I raced against both when I had my Crescent. Glyn crashed during the second season damaging his shoulder so Chris was promoted to the newer bike and I just beat him for the Newmarket 500cc championship in 1977. I wanted to use the older bike in the 1977 MGP and approached Andy with regard to this (as Andy had been supplying a 250 Suzuki for myself and Graham Godward to ride in the 10 lap production TT, but they scrapped the race). Andy agreed to this providing Chris Rossiter agreed, which he didn't so I never got the bike for the MGP. So the championship win was even sweeter beacause of this and the fact that I crashed my Crescent during Wedneday evening practice at Windy Corner and whilst recouperating went along to the 'ACU National Clubmans' championship round at Waterbeach to watch, where Chris Rossiters' girlfriend informed me that she was glad I was injured as it would give Chris the championship. But two weeks later at Snetterton for the final round of the Newmarket championship I beat him (in fairness I seem to remember a clutch operating clevis pin dropping out of his TR500 engine which hampered him). At the end of the season Andy sold both bikes and I can't remember the team participating in road racing again, probably to concentrate of his son Michaels' burgoning career and his championship in 1980 and the unfortunate aftermath. Edited by tonyed, 30 November 2013 - 08:04. Nor sure why, but this thread seems to capture the essence of racing in the 70s better than others involving the superstar riders. You can almost feel, hear, smell and touch the wonderfull atmosphere of those fantastic times from the brilliant photos. Many thanks to those involved. Totally agree, I was never a superstar rider, or even a star rider ( once had a second place ) so this thread is relevant to my racing days and I'm loving it...pity there's nowt from Croft, Carnaby, Silloth, Elvington etc, I've already posted most of mine. I had to use google chrome to get a result. my problems started after upgrading to explorer 11. Don't give up Paul, though I know how frustrating it is when not working as was!! 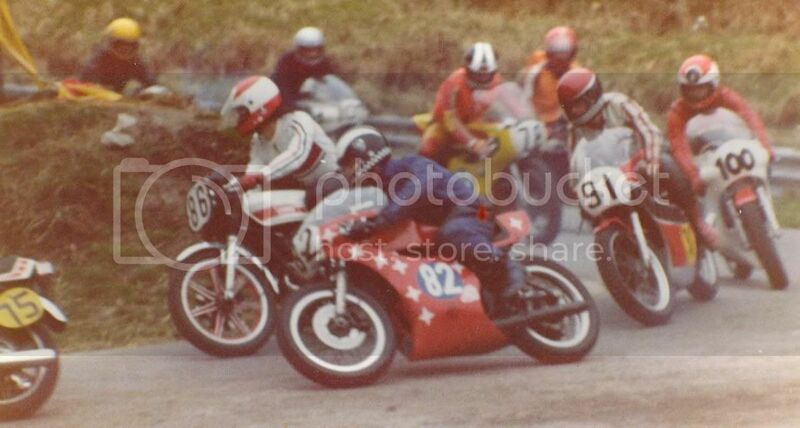 A few of Gareth Jones in 1975 @ Brands Hatch. Photos Copyrighted to Graham Etheridge. Gary Orrin on his 250 Ducati, Brands Hatch 1975. Spoken about him before & I think Tony filled us in on his (true) details, here is Eccles Cayke @ Clearways 1978 trying a new line! & Waterbeach in 1977. Dennis Casement @ Snetterton 1976. Another one of Colin Aldridge, Brands, 1977. Robin Drury, Jerry Fiford, Brands 1977. Right here goes again, i've hitched a ride over on firefox rather than IE11 this time to see if it helps!! 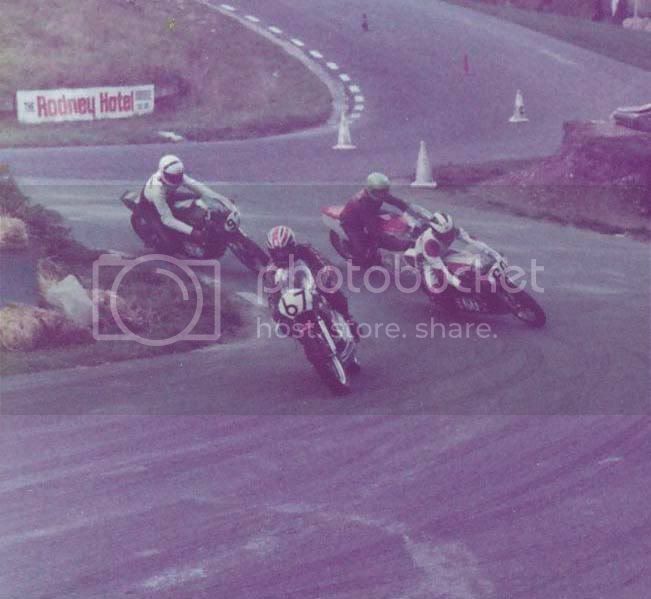 Dont know who the guy on the big proddie is but I never caught him and the wheelies werent for show I was just getting a bit giddy trying to catch the bugger!! Edited by Paul Collins, 30 November 2013 - 16:22. Ian Bell was he sponsored by a fish & chip shop? Yes Ian was backed by 'Fish and Chick' a local takeaway owned by Tony Norbury who some years before had helped to launch Roger Marshalls solo career when he ran another eatery called 'House of Hay' Roger's TR2B ran in his House of Hay colours in 1972. Adrian through the years, 1975 @ Brands Hatch, 1976 & 1977 @ Snetterton. Troutt brothers 900 Honda outfit @ Brands Hatch 1977. Graham Godward Brands Hatch 1976. Stephen Russell with Jerry Fiford in background, Brands Hatch 1977. Graham Atha #22, Nigel Harris #96, John Kearsley #101 Snetterton 1976. Simon Beaumont and Peter Cook ( following shot ) were Croft regulars. I loved the paddock at Croft, the Teessiders parked at one end, ie John Webb, Alan Stewart, John Wilson, Geoff Johnson, Neil Fowler etc while at the other end, near the esses were the geordie mob..Norman Tricoglus, Dave Clarkson, Ray Knox, Trevor Jones, Mac Hobson, occupying the middle were the non locals such as Bill Ingham, Rob Brown, Adrian Marsh, Simon Beaumont, Roger Nott, Steve Tonkin. Lots of others such as Neil Mason, Trevor Cooper, Phil Hitch and myself fitted in where ever we could. Loved every minute and yes, I do wish I could go back....if I've missed anyone out please forgive me , you're part of the best memories I have. Nice one Greg, I only ever was a spectator but I wish we could turn the clocks back to this time & re do it again!. When did Jerry have an Aermacchi? Good question, after all these years your right Robin its not Jerry, it is I think? as there only was one 350 Aermacchi on this day #104 (he hasn't put all his numbers on!?) Lawrence Parris from West Dulwich London. Tell a lie Reg Arnold had one also but its not him as I have a picture of him. Simon was a buddy of mine, havent seen him for a good few years now, he was a very underrated rider and won a hotly contested Marlboro Clubmans 350 championship around 1980, this went largely unoticed and he eventually ran out of money and quit. You just reminded me of another name there, i'm sure I have a photo of Phil Hitch somewhere too i'll have a look. Phil Hitch worked as an apprentice at Coopers Coaches ( Where Tescos Durham is now ) and was helped to start racing by Trevor and Barry Cooper who both raced, when his dad bought him a new TZ250F( '79 ) from Padgetts he started to get results but in following seasons the results petered out and he quit. He was a mate but haven't seen him for years, his main sponsor was a bike breaker on Westgate Road,Newcastle by the name of Steve Bates who I seem to remember later came into contact with the HM Prison Service... my info is over 30yrs. old so may not be entirely correct. Well said . Keep 'em coming Graham - if you have anything else left that is ! I bet there are loads of pictures stuffed away in peoples drawers (!) that we would all love to see. Don't be shy folks, have a rummage and get them on here! Nobody is going to criticise the photographic quality (or lack of) and for my money, the paddock ones are the best! Here are two randoms from my own collection. In the first shot (at the 1975 MGP) I seem to be explaining something to someone, while the bloke with the 'tash if I recall, is pissed as a fart and trying to pick a fight with his mate (you can't take those Celts anywhere!). And that's my old Thames! The second picture shows me and Phil Landeg chatting in the warming-up area at Mallory. Somewhere I have a shot of Phil Hitch and me together going around Tower, and in the same set some Croft grid shots, just need to find them and get them scanned. Great photos Barry not seen those two before I don't think? I wonder who the bearded rider behind you & Phil is? Greg & Paul keep em coming, never ventured further than Watford Gap back in those days so most of these guys are new names to me! Gordon Green & family in paddock & Gordon on his 125 Monoyam @ Brands Hatch 1976. Forum member Keith Hanford (khsuzukitr500) on his TZ350. Keith, with another Keith (Ferrell) who is caught having "a moment" at Llandow! Pictures courtesy of Dennis Ferrell. Edited by knickerbrook, 01 December 2013 - 16:32. Edited by Paul Collins, 01 December 2013 - 16:00. Again crap quality but the aforementioned Phil Hitch on my case at Tower, I must get a scanner and do a proper job of these. I remember Dennis, he had a pair of immaculate Manx Nortons, always wore a shirt and tie under his leathers, I bumped into him at Old Warden ( the Shuttleworth Collection ) at an air show some years ago, probably late 80s or early 90s, he was on a 70s Trident and still had the Nortons but no longer raced them. Just keep them coming Paul, I think there's only you and me on this forum that were Croft regulars. This one is of the waiting area at Ouston which was and still is an old airfield in Northumberland that the North East club used when Croft closed 81ish, Phil Hitch is 19 and 5 is Graham King. Ouston is now known as Albermarle Barracks.